Zamorano Cheese for sale. Buy online at Zingerman's Mail Order. Gourmet Gifts. Food Gifts. 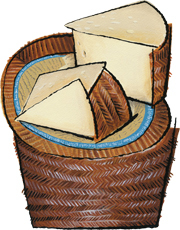 If Manchego is the cheese of Spain, Zamorano may be its attractive cousin from the country. Made from the raw milk of Churra and Castellano sheep, the cheese is typical of the types found in Spain, a small drum of a wheel that, if you didn't know, you might mistake for a Manchego. We've secured a batch aged for at least six months, twice as long as most Zamorano on the market. The extra aging concentrates the flavors. Fruity, flaky and distinctly nutty, Zamorano has a slight saltiness in the finish that leaves your lips smacking for more. It's the kind of cheese you want to flank with complements. I recommend a dry Fino sherry and some exceptional Portuguese quince spread. Wow! The wheels we are currently cutting into are knocking my socks off. They have huge, bright fruity flavor. It's some of the best Zamorano I've ever tasted.